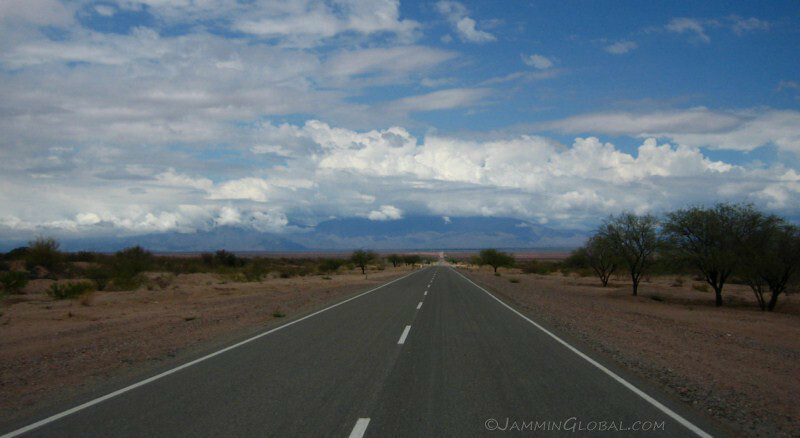 Getting good vibrations from northwest Argentina (not just from the corrugations), I continued south on Ruta 40 from Cachi across the middle of the country, down to Mendoza, making it there in time for New Years. 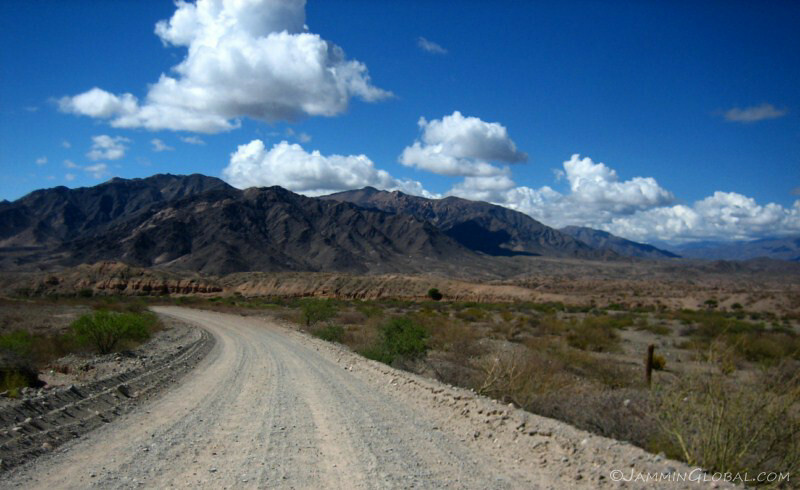 From Cachi, Ruta 40 goes through some remote terrain. As there are paved alternatives for the locals, the ride remains a destination. 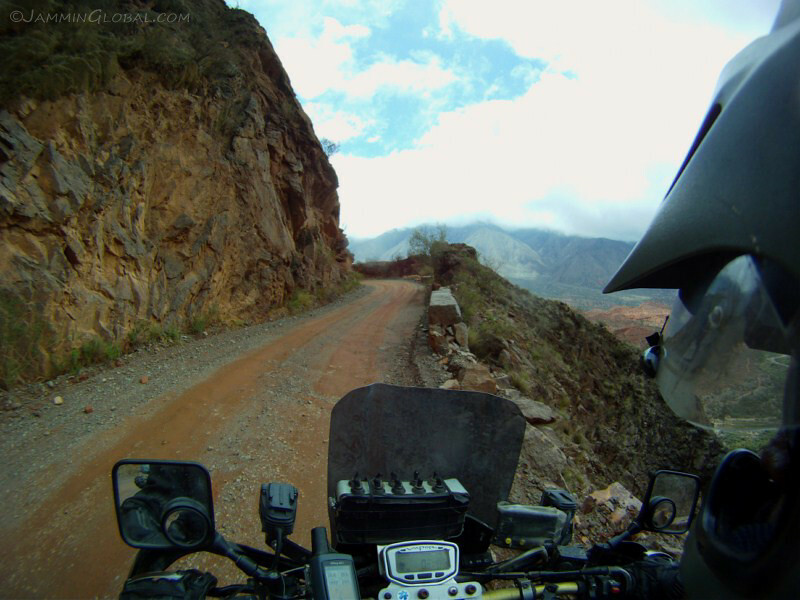 The route hugs the tight crevasses of the hillsides and dips in and out quite sharply, making for an engaging ride. 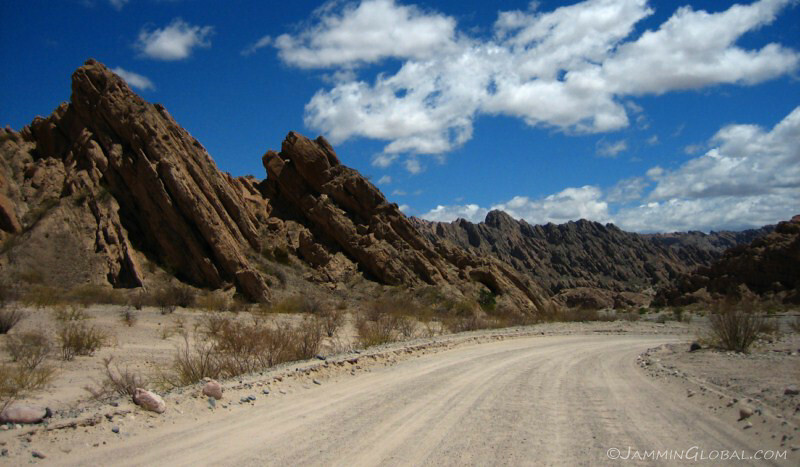 It gets narrow in places, like passing under this boulder-hewn wall, evident of past flash floods carrying big rocks and boulders down from the eroding Andes. The little stream up in the mountains of yesterday had now grown into a proper river and Rio Calchaqui was supporting a blanket of green spreading from its banks into these farms. 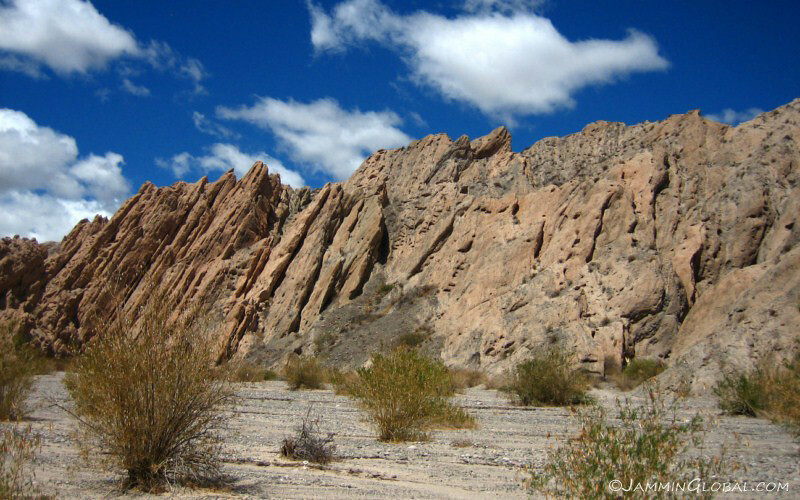 Between Molinos and Angastaco, geologic forms stand out right by the road. Heading into the Corte el Canon. 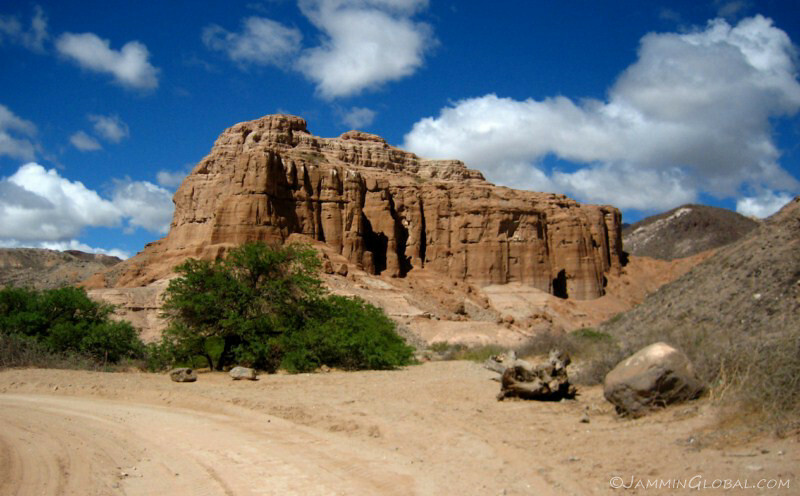 A narrow canyon with spires of rock. These flat layers have been pushed up and out of the ground by the giant forces constantly at work deep underneath our feet. 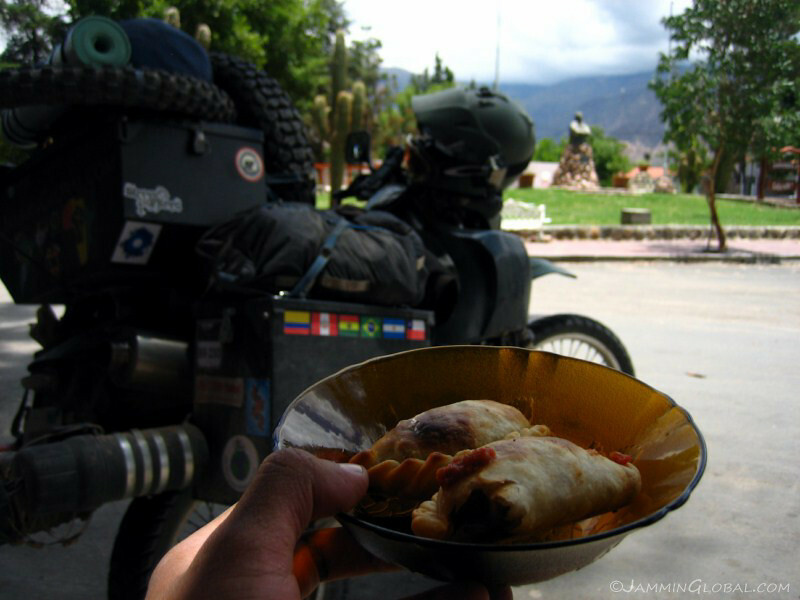 Back in Cafayate and I stopped at the same little shack from my trip heading north for a lunch of some emapandas. 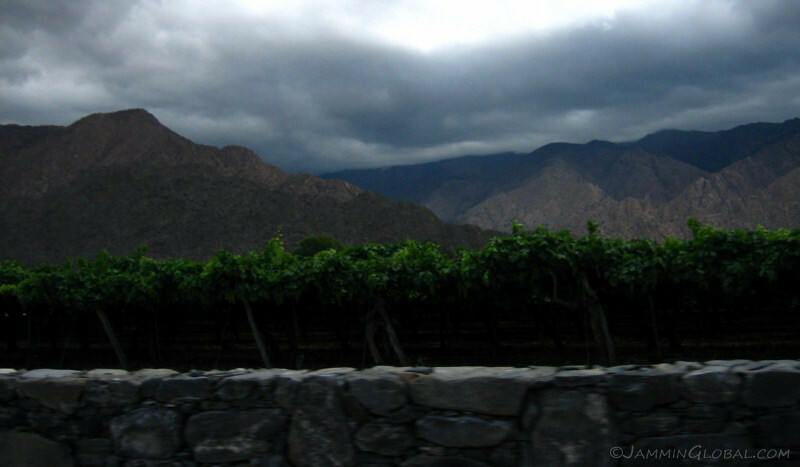 The vineyards of Cafayate with the tall Andes to the west. 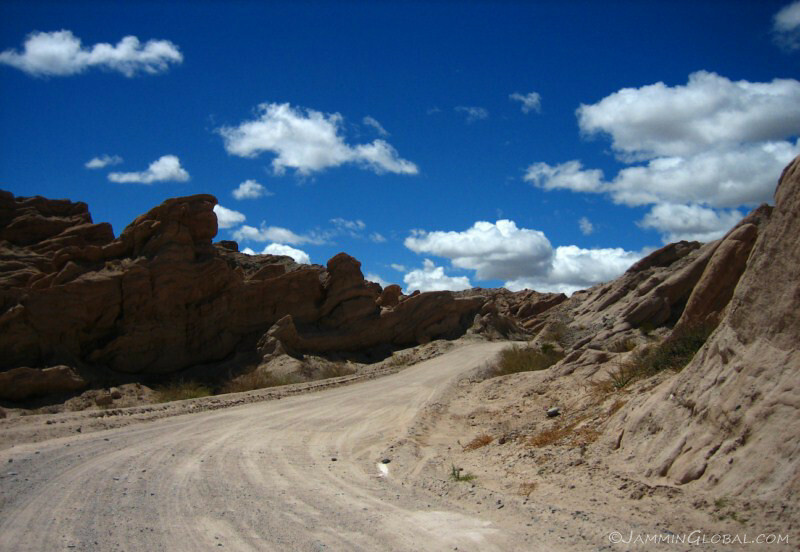 From Cafayate till the Lake District, Ruta 40 stays out of the high Andes and cuts across the flat lands in its shadows. 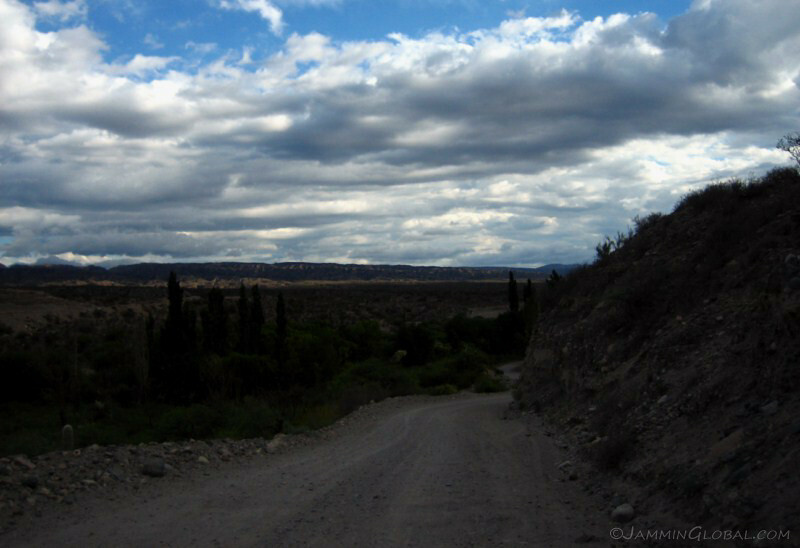 It’s not all paved, yet, and once in a while the route goes up and over a small ridge with the terrain being generally dry. 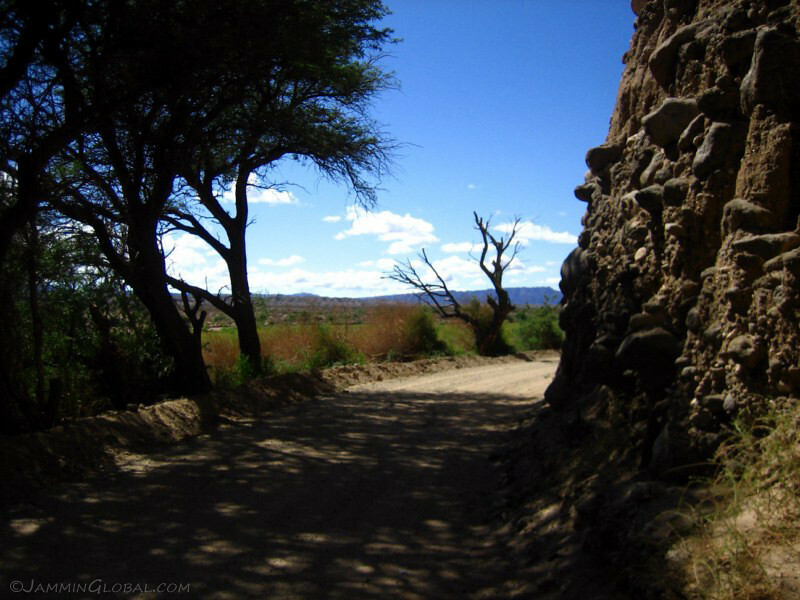 This dry land is punctuated by rivers flowing out of the mountains and with the rainy season started in the north, arroyos provided for fun water crossings. This is where you need a riding buddy, to take pictures of you splashing across the stream. Stopping for the night in the small town of Haulfin. 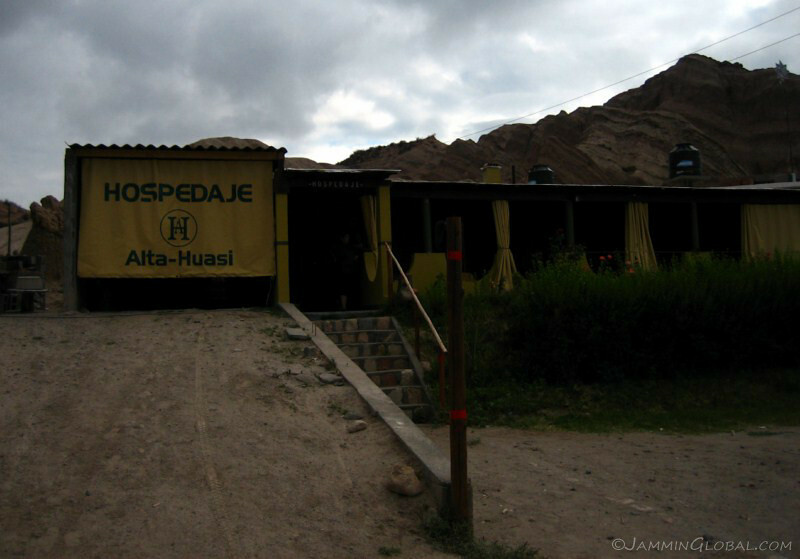 The owner of this hospedaje told me of the various other Ruta 40 travelers that had stopped here over the years. 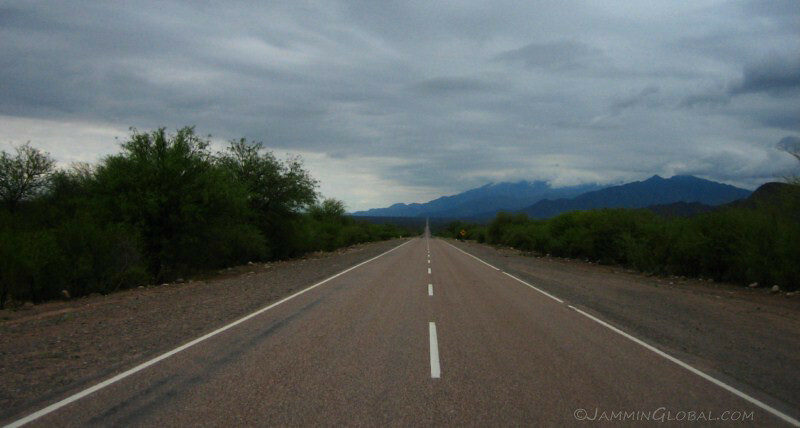 Traversing the length of this road is popular with travelers from around the world. 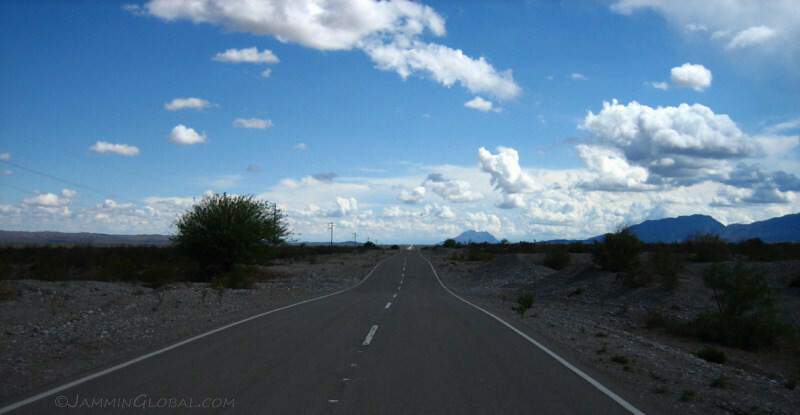 …it’s defined by ultra-long stretches with no turns for about 20 – 30 kms (12 – 19 mi) at a time. With only a few towns here and there, the route was heading south as efficiently as possible. 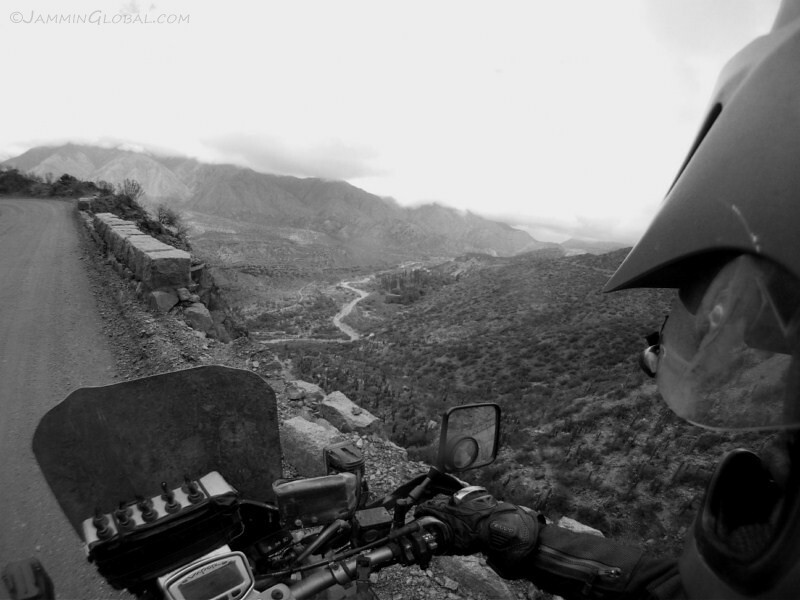 I yearned to be back riding in the mountains, but knew that that time would come soon. 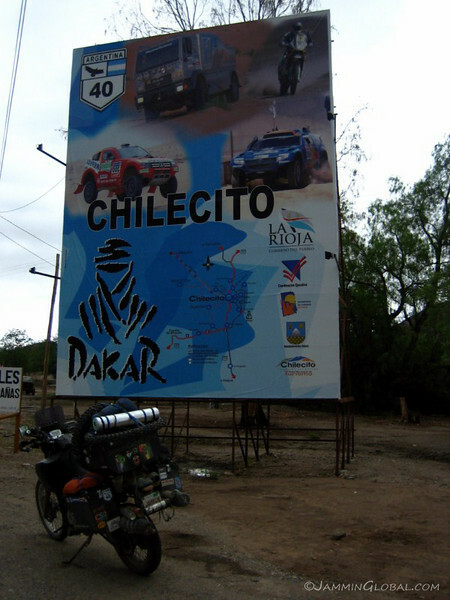 A billboard in the town of Chilecito proud to host the famous Dakar Rally Race. 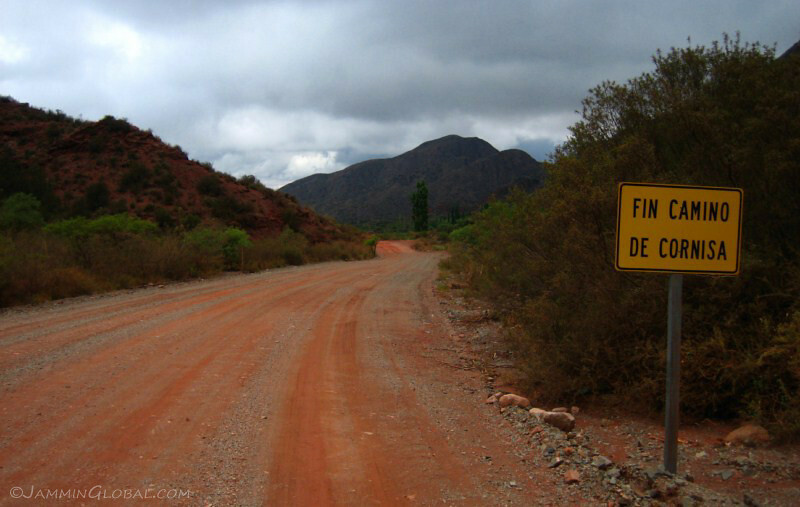 It was starting in just a few days from Buenos Aires and would pass through here in about a week. The race moved to South America after security threats in northern Africa and is hugely popular among all the gearheads of this continent. 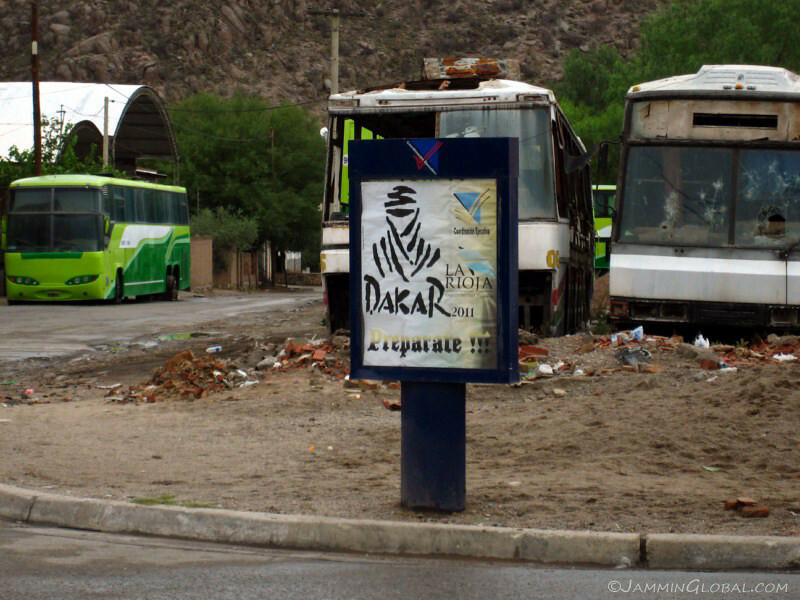 The buildup to the race is quite big here and people would come up to me and say, “Vamos al Dakar” (let’s go to the Dakar). I could probably enter in the truck category, seeing that I’m carrying my support vehicle with me. Time not being on my side, I continued on. 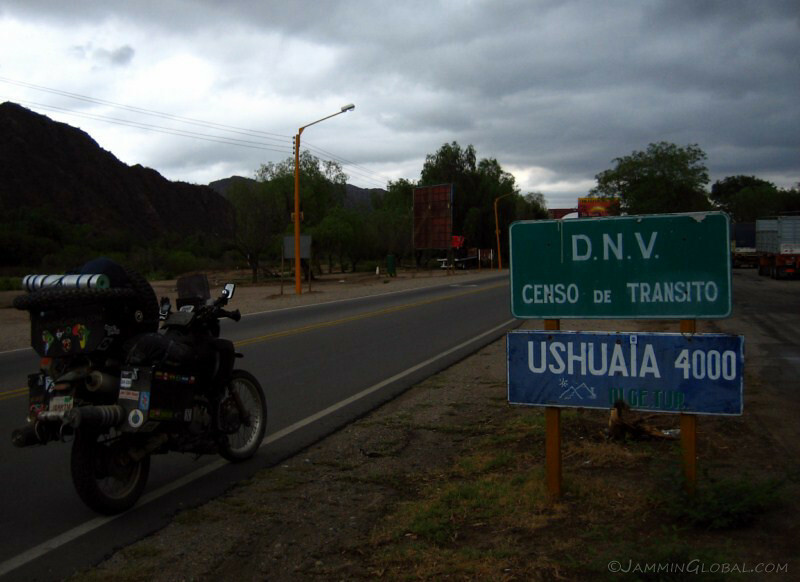 A road sign indicating 4,000 kms (2,500 mi) to Ushuaia. 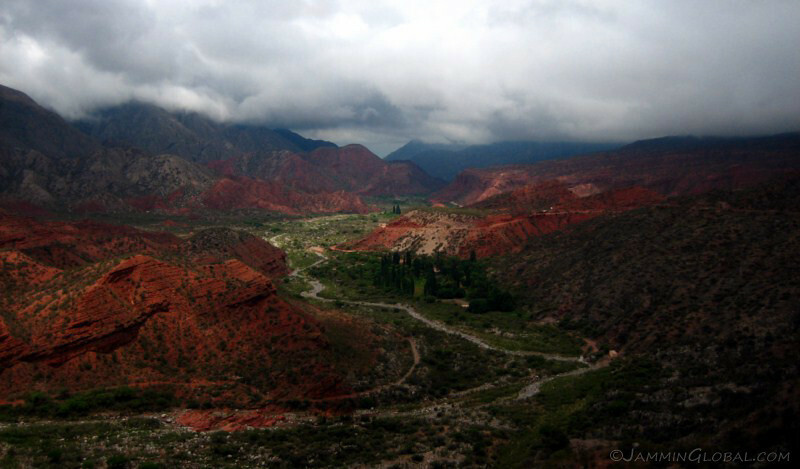 From Nonogasta, the route heads over this strikingly red mountain. 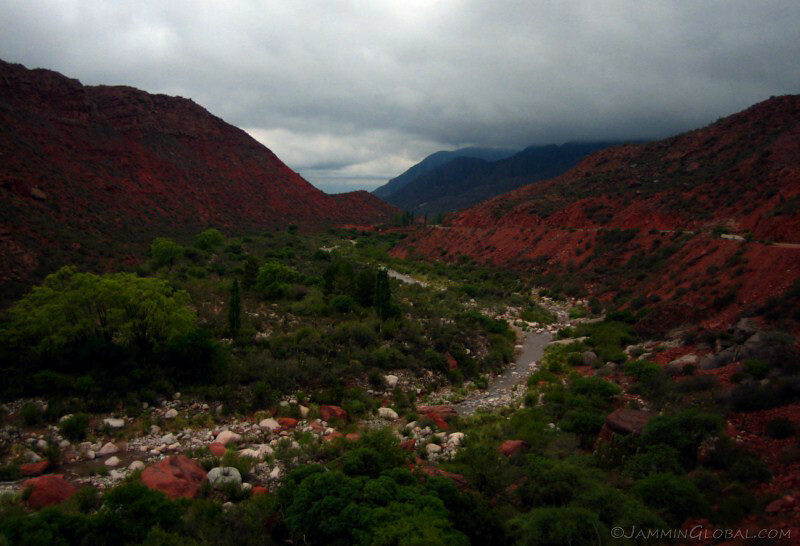 The red stands out all the more in contrast to the greens of the valley below with Rio Miranda and the blues of distant mountains. Even without the striking colors, the valley is quite impressive. There’s a short section of off-road as it goes up and over a small pass. 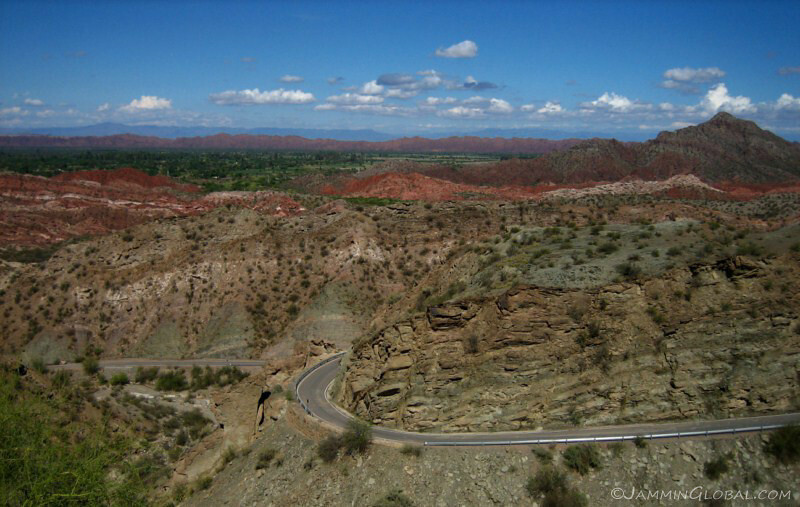 A wider view of the red canyon. 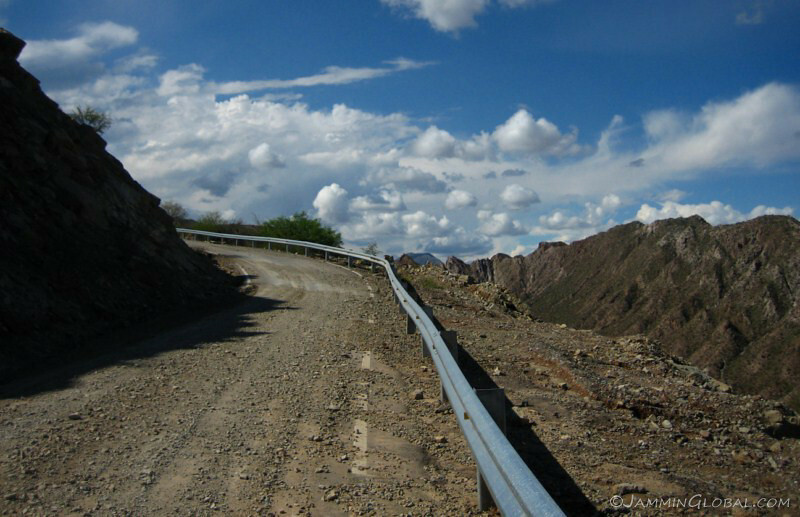 End of the twisting road as it descended down from the pass. 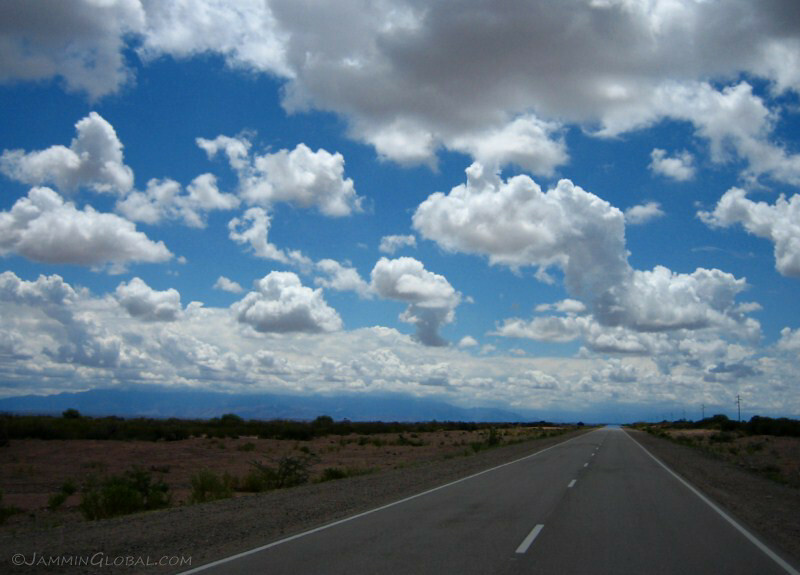 And back to our regular programming of straight-as-an-arrow empty roads under big, blue skies with white, fluffy clouds. 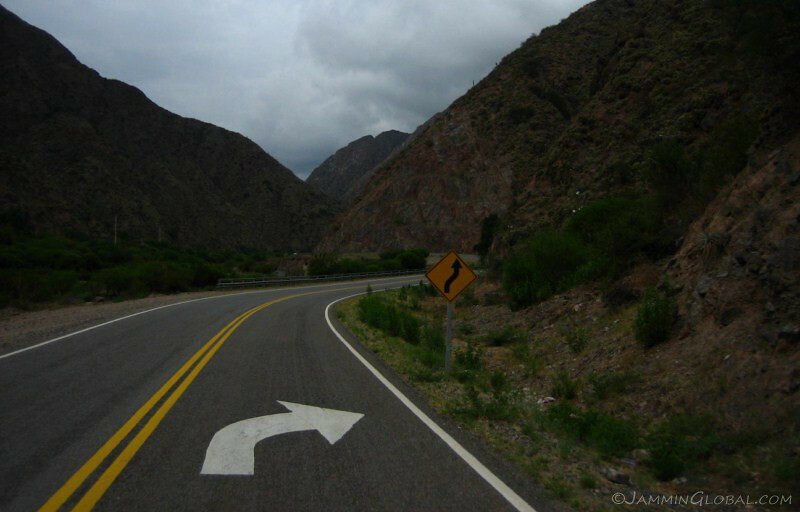 The excitement picked up as the route gained some relief and became defined by ‘badenes’, the dipping down and up over the numerous arroyos that are characteristic of this area. 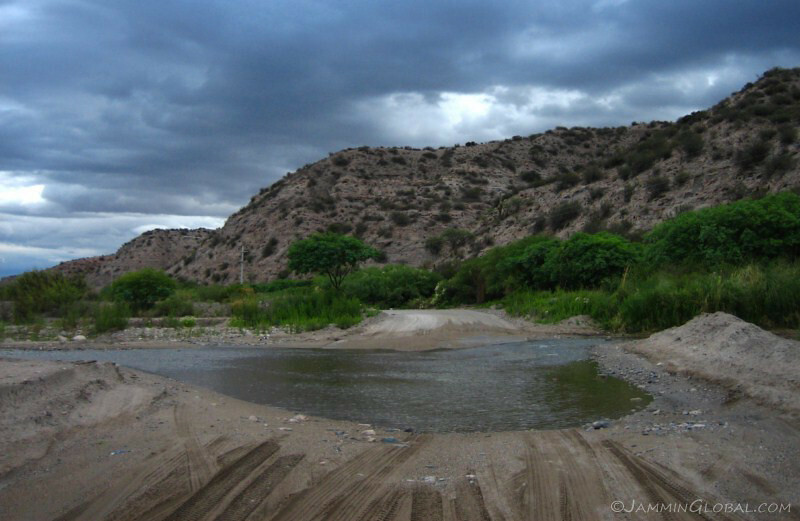 In the rainy season, water flows down the hillsides and instead of being collected in one river, the wide slopes allow the water to run where ever it wants and being impractical to build a bridge over every possible arroyo, the road simply drops down into the arroyo. 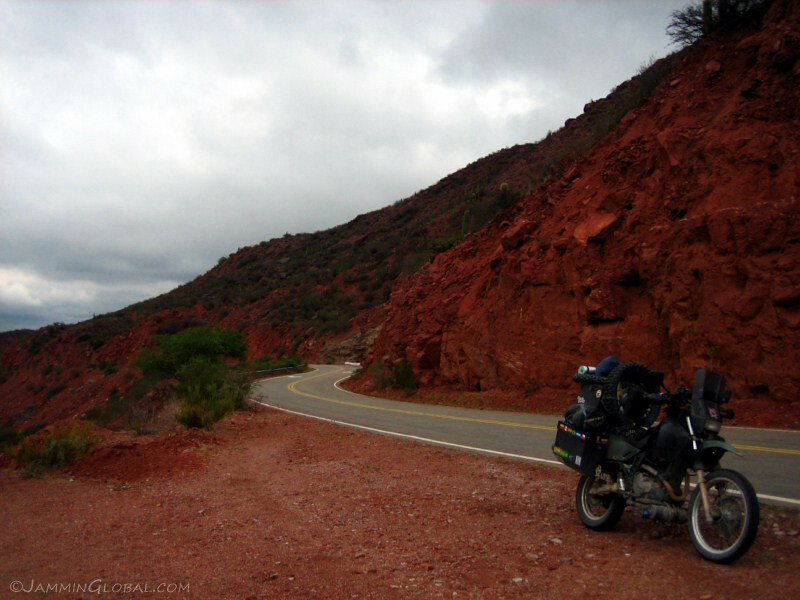 Near San Jose de Jachal, there’s an older route that goes up and over the scenic ridge of La Cienega, compared to the newer Ruta 40 that goes around it. 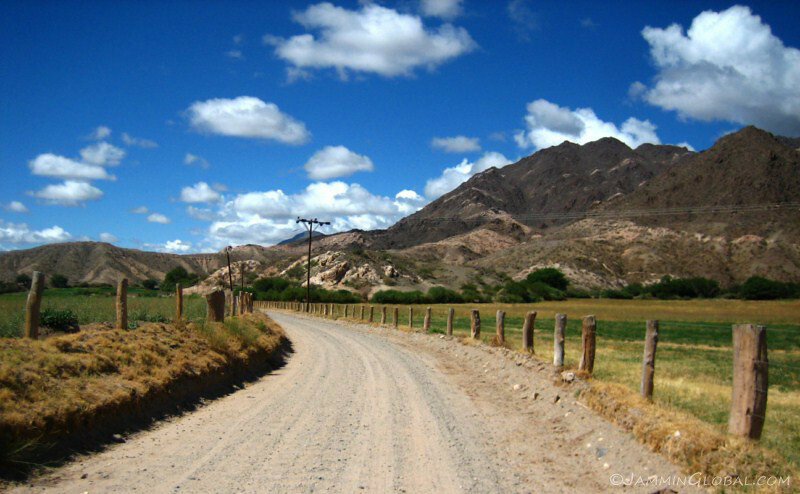 It’s a narrow, paved road, covered in heaps of falling rocks. 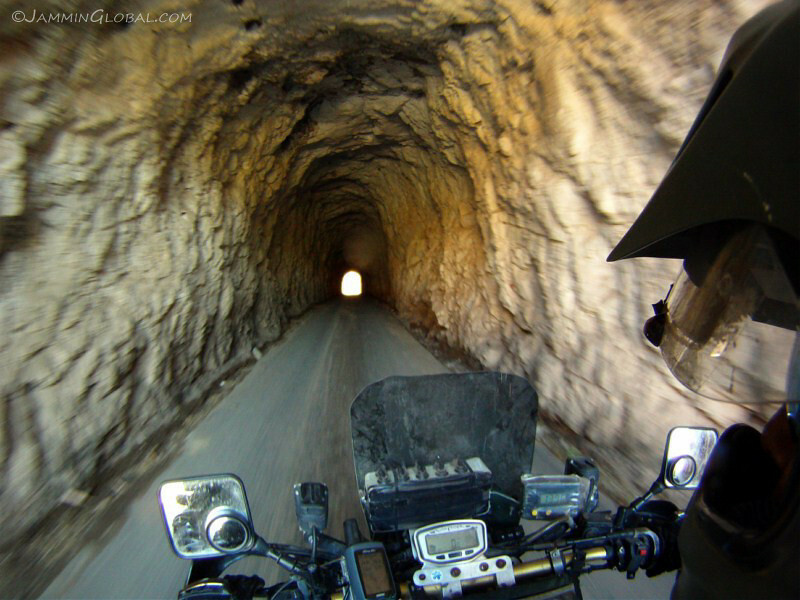 And a tunnel ride taking you from the scenic canyon back to the bland landscape on the other side. 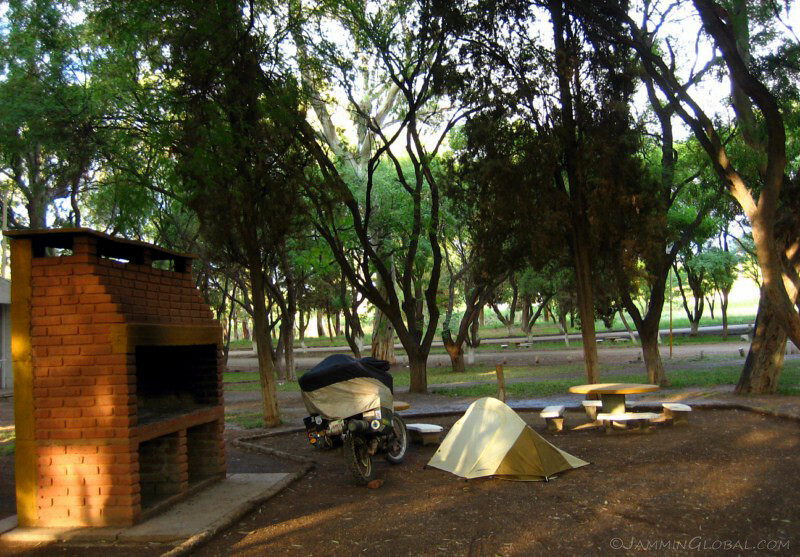 I pitched my tent in the municipal campground, just outside the town of San Jose de Jachal. It was free and I think it’s mainly a day-use place but I asked some locals if it was all right to camp and got the go ahead. There was a basic bathroom nearby and the trademark Argentine place for an assado. 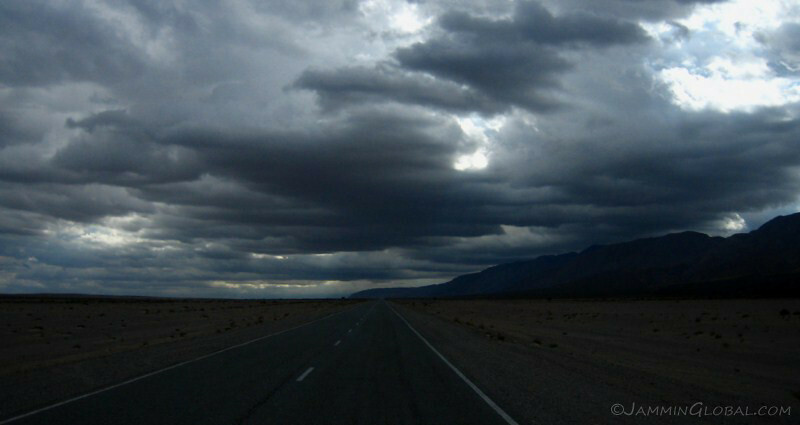 The straight roads made quick work of the big land and I covered 530 kms (330 mi) today. Having some chocolate oatmeal for breakfast, which was my daily morning food for the past few years in the US, much to the consternation of my colleagues. 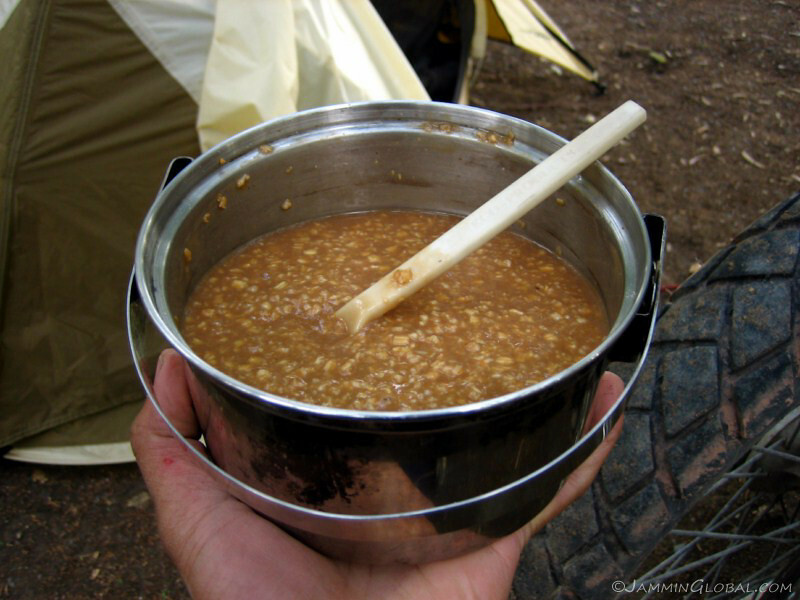 I’m missing some walnuts, raisins and coconut to make this some truly gourmet oatmeal. Minus the chocolate, this is a good traveling food as it’s cheap, easily available all through Latin America, healthy and being a complex carbohydrate, its energy is slowly released over a few hours instead of the sudden release of glucose from simple carbs like those in white bread. As I left town, I was hailed down by these guys from the local TV station. They had seen me yesterday driving through town and figured I would make a good lifestyle segment to their daily newscast. They interviewed me for about 15 minutes and I told them my story. Being from India always adds a novelty factor and I was complimented on my Spanish. I asked them to send me a copy so that I could proudly show my parents. 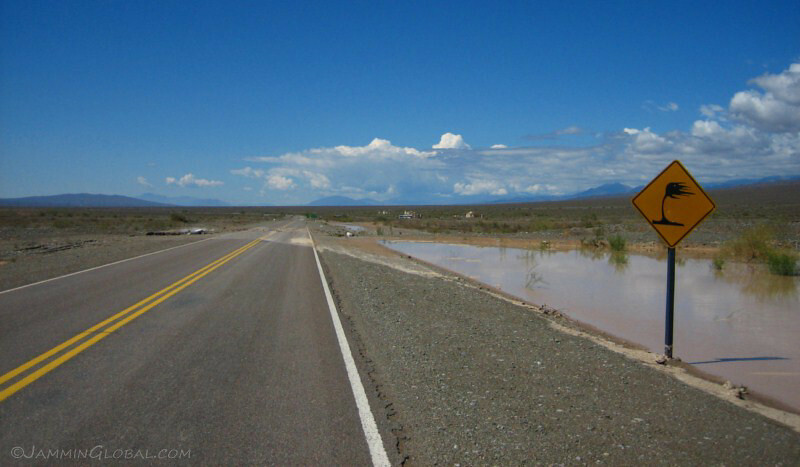 It had rained the previous night and knowing this to be arroyo-land, I was expecting some water crossings. 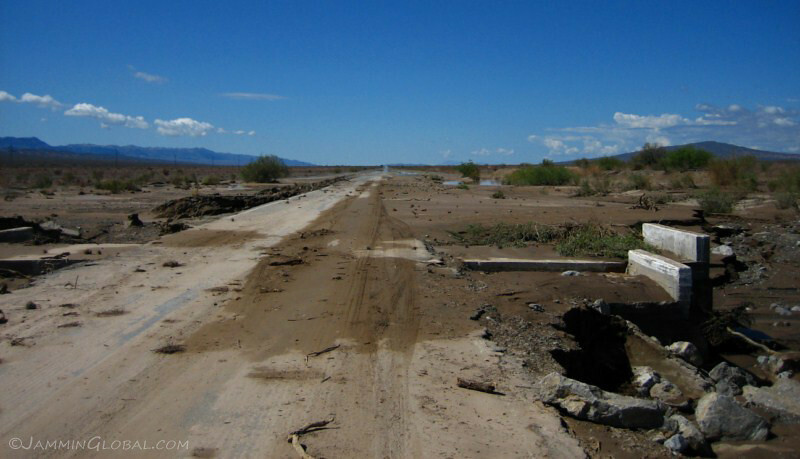 However, the damage was much worse with the muddy water flowing over the road and depositing debris for a stretch of about 20 kms (12 mi). The TV crew were actually on their way down the road to report on the overnight damage done to the 40 with cars skidding off the mud into the ditch. Earth movers were also dispatched to push the errant mud off the tarmac. 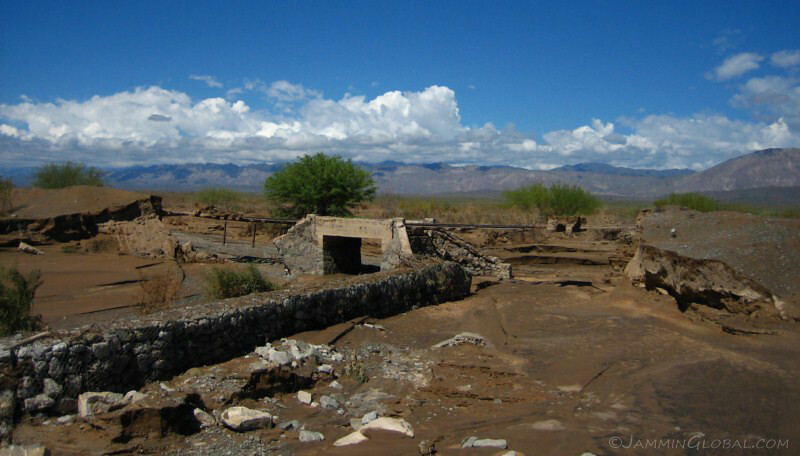 This is an arroyo gone bad. Instead of following the rules and flowing under the little bridge, the heavy rain-induced flows swept across this whole area, removing ground from under the train tracks and carrying all that mud onto the road. 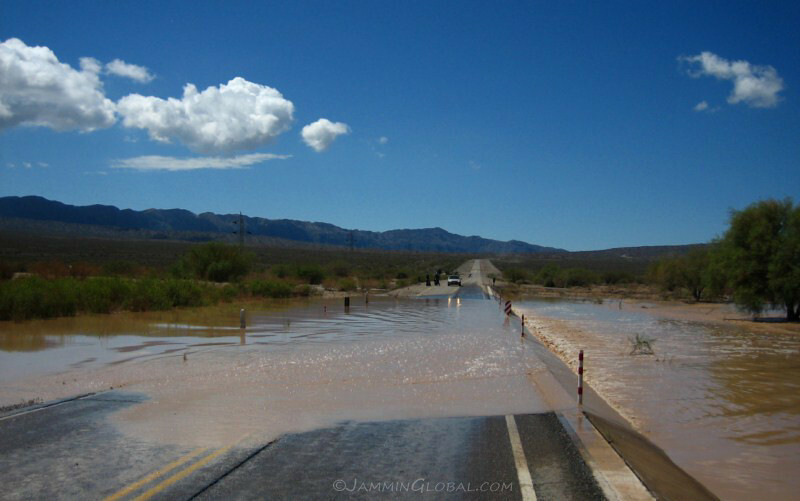 And here was the biggest water crossing with water flowing across a flat section of the road. After seeing a Toyota Hilux go through and seeing that it was less than a foot deep, I powered across. 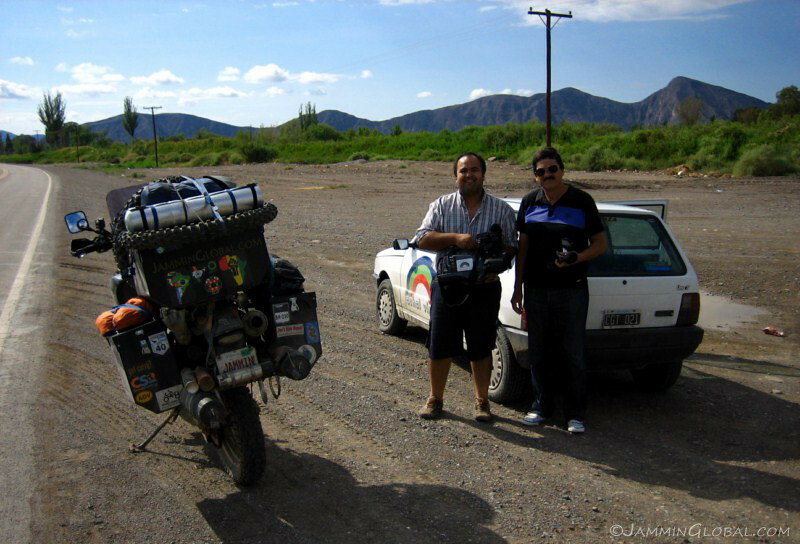 After the excitement of the morning, the route quieted down and it was a relatively quick ride to Mendoza. 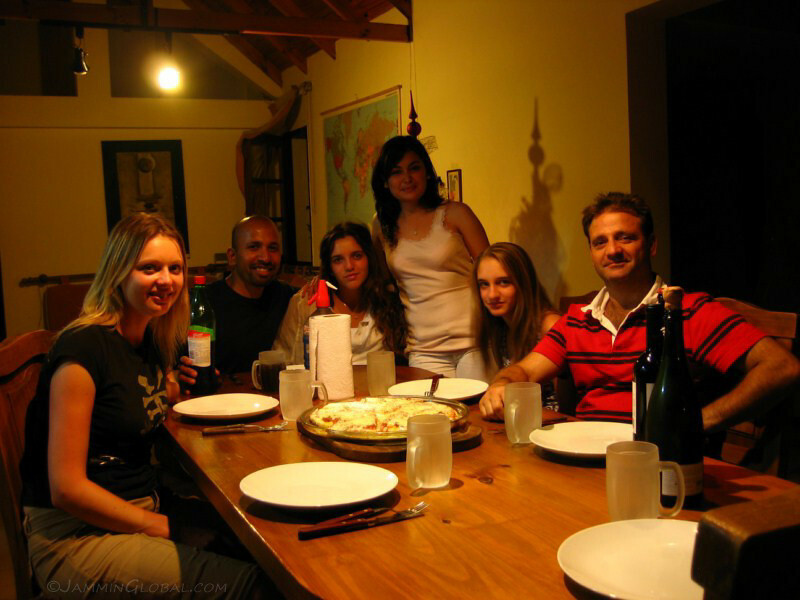 I spent New Years Eve with Alejandro and his family in Mendoza, through CouchSurfing. He runs a pharmacy below his house and recently got addicted to traveling by road. He purchased a motor home in Spain and plans to travel for six months through Europe and asked me questions on where he could continue with his travels. I took a few days off, replaced the clutch on sanDRina and prepared for the next leg.